One more mile and it all could have been so different. Aric Almirola‘s heartbreak in last year’s Daytona 500 will be played in highlight reels forever — on the wrong side of history, as they say. One would think a sour taste would still resonate almost 365 days later. But he’s over it. 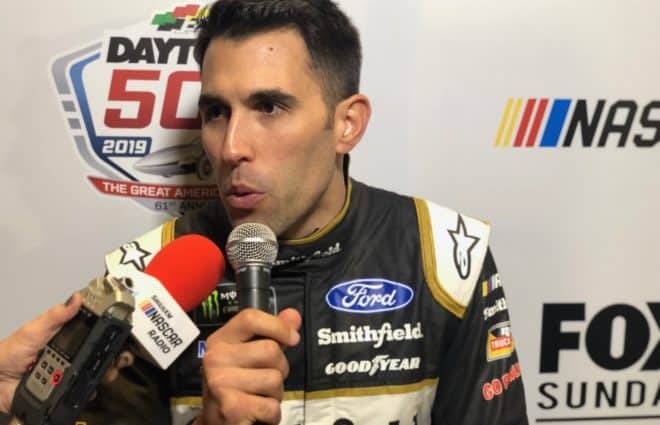 “I don’t have a negative attitude towards last year’s race,” Almirola said Wednesday, Feb. 13, at Daytona 500 Media Day. “It was tough to swallow. Defeat is never easy and especially in that situation, right there at the last minute in the closing mile of the race. “I feel like everything in life happens for a reason and I feel like if we would’ve won right out of the gate, things might’ve went differently for our race team [last season]. That was a hard one, but I really feel like it made our team grow together and created a bond amongst me and the guys to kind of rally around each other, pick each other up, hold our heads high and go onto the next race. Daytona holds a special place in the 35-year-old’s heart. He’s had more success at the 2.5-mile superspeedway than any other track in his career, earning his first career Monster Energy NASCAR Cup Series win there in 2014 and an Xfinity Series victory in 2016. But he doesn’t know why the World Center of Racing suits him. It would’ve been difficult to ask for a better inaugural season with Stewart-Haas Racing than the one Almirola had in 2018. A career-high in top 10s (17), top fives (four) and a win at Talladega Superspeedway was almost parlayed into a Championship 4 berth. Last year was admittedly better than initially expected for the driver of the No. 10 Ford. Coming from Richard Petty Motorsports where top 20s were considered successful to competing for wins inside the top five every week was an uptick of a lifetime. Almirola said one of the most exciting parts about the move to SHR was the rising level of intensity, turning into an improved performance week in and week out. It also meant the ball would be in his court, knowing the equipment would be top notch. With 36 races in front of him coming off a career-best fifth-place finish in the standings, there may be some added pressure. Improvement is what the No. 10 team is striving for. But it’s not planning on changing many moving parts. On Monday, Almirola tweeted a photo of him hitting the wall on the final lap of last year’s Daytona 500 with one word: redemption. He’s been in the position before, and he’ll be in it again. If that time comes Sunday, Almirola is not letting this one slip away. 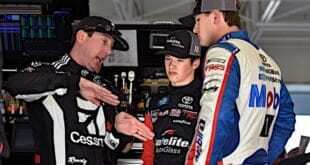 Next 2-Headed Monster: Should Drivers Be Penalized For Field-Killing Crashes?